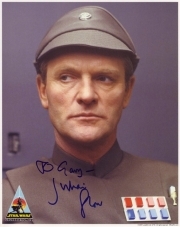 Julian Wyatt Glover is a British actor best known for such roles as General Maximilian Veers in Star Wars Episode V: The Empire Strikes Back, the Bond villain Aristotle Kristatos in For Your Eyes Only, and Walter Donovan in Indiana Jones and the Last Crusade. Glover was born in Hampstead, the son of Honor Ellen Morgan (née Wyatt), a BBC journalist and a close friend of novelist Barbara Pym, and Claude Gordon Glover, a BBC radio producer. His younger half-brother is the musician Robert Wyatt. Glover has been twice married to actresses: Eileen Atkins and Isla Blair, with whom he has a son, actor Jamie Glover. In 2006, he held the role of Edward Alleyn Club President. Glover attended Bristol Grammar School in Bristol, England, where he was in the same class as actors Timothy West and Darth Vader actor David Prowse, and also Alleyn's School in Dulwich. Glover trained at the National Youth Theatre and performed with the Royal Shakespeare Company. In the early 1950s, he appeared in several shows at Unity Theatre, London. During the 1960s and 1970s, Glover frequently appeared in British television shows, including The Avengers, Doctor Who, The Saint, Strange Report and Blake's 7. Julian Glover also appeared in 1967's Quatermass and the Pit, a Hammer Films adaptation of Nigel Kneale's 1950s BBC television original, in which he portrayed Quatermass' nemesis, Colonel Breen, a military man, initially sceptical of the ancient origin of an archaeologically excavated extraterrestrial spacecraft, who is later ironically in thrall to the murderous energy released from the craft. In 1979, he appeared as the villain, Scaroth, last of the Jagaroth, in the Doctor Who story City of Death, one of the most popular serials in the original run. He later recorded DVD commentaries for recently rediscovered The Crusade episode "The Wheel of Fortune" (from the Lost in Time DVD set) and City of Death. He made some of his most notable appearances during the 1980s as the Imperial General Maximilian Veers in Star Wars Episode V: The Empire Strikes Back , the ruthless Greek villain Aris Kristatos in the James Bond film For Your Eyes Only , and the deceptive American Nazi Walter Donovan in Indiana Jones and the Last Crusade . During the 1980s, he played the leading role in the BBC television drama series, By the Sword Divided. Glover has been associated with the Anglo-Saxon epic poem Beowulf since the 1980s, delivering various forms of staged interpretation. Taking the role of an Anglo-Saxon gleeman or traveller poet he delivers an abridged version of the tale whilst stood around a mead hall hearth. This powerful 11th century Old English text, set in the dark age Germanic world of the Geats, examines Anglo-Saxon concepts of honour and comitatus. The performance is interspersed with Glover rendering selected passages in the original Old English. This adaptation has been shown in documentaries on both the English Language and Anglo-Saxon England. Most recently, it was shown in Michael Wood's documentary 'Beowulf', broadcast during the BBC Poetry Season on BBC Four and BBC Two in 2009. He recently played the role of Mr. Brownlow in the West End revival of the musical Oliver! at the Theatre Royal, Drury Lane. Glover plays a 101-year-old Polish veteran RAF pilot in the short film "Battle for Britain" . Since 2011 he portrays the character of Grand Maester Pycelle in HBO's Game of Thrones, the TV adaptation of the first volume of George R.R. Martin's fantasy novel series A Song of Ice and Fire. He is an Associate Member of the Royal Academy of Dramatic Art. In 2011 he appeared in Casualty as an elderly man named Sebastian who was crushed by his mobility scooter. Whole or part of the information contained in this card come from the Wikipedia article "Julian Glover", licensed under CC-BY-SA full list of contributors here.